I am walking on a gravel road on Bainbridge Island in Washington state under a dove gray sky. There is no rain—and none is predicted—which is odd in this rainforest of a state. Sam, the golden retriever, walks ahead of me, turning now and then to look for me. I like that in a dog. We are walking just to be outside, because we can. Someone I love lies upstairs in her house sleeping the sleep of the exhausted, of the chronically ill. For two days I’ve been here the BFF has been on her feet (“like a normal person,” she joked), and for a couple days before my arrival, cooking beef stroganoff, making potato leek soup and something in clear glass in the fridge that looks tomato-y and vegetable-y. Last night she whipped up cheese-y biscuits from scratch to go with the potato leek, topped with sour cream and bacon. The BFF picked me up from the airport with two daughters in tow—Maggie, who is finishing her senior year of high school, and Emma, a year older, home for the weekend from her new house in Tacoma where she lives with two roommates and two staff people who care for them. The BFF looked better than when I left her in October—her face was cheery and her eyes bright. Her hug was as warm as her smile. “I’m so glad you’re here,” she said. And so was I. Before we took the ferry home to B.I., as the locals call it, the BFF drove us all to Ikea in Renton, a place where they’ve spent lots of time in recent weeks, getting Emma’s new living space set up. “How long have you been in your new house, Emma?” I ask in the car. “Four weeks,” says Emma from the back seat. Then silence. I know that Emma is not big on spontaneous follow-up. I start to ask a question to prompt her, and she pipes up, “I like my house,” she says. I grin at the BFF, who nods at me with a half smile. She, too, is feeling better. Weekly acupuncture has helped. But living with cancer is not fun, no matter how you slice it. I know that for every day she is up and feeling relatively well, there will be corresponding down times, too. She’s had a lot of down times in the last six months. Today is an up day. Today, it turns out, is also a knitting day, for later that evening, sitting up in bed, as we watch an older BBC series, the BFF starts knitting me a scarf. 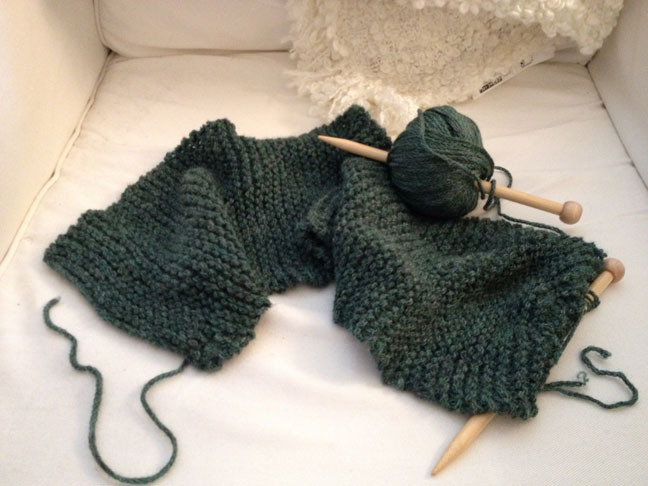 I have found in her ample stash of yarn some soft gray green wool the color of winter pine needles on this island. The BFF has taken up fat wooden needles and expertly casts on. By bedtime, she has five inches of new scarf trailing from them. We all go to sleep—two girls, two older BFFs and Sam—happy and warm, though it is literally freezing outside. If it were to rain tonight, we might awaken to snow on the ground in the morning. The next day, too, is an up day, though the BFF rises to take her medications and goes back to bed around 9ish. By early afternoon, she is up and showered, and Emma is ready for her ride back to Tacoma. Maggie will spend the afternoon with a new friend—a boy, who is “not yet” a boyfriend, she tells us—watching a playoff football game that has everyone in this state ga-ga with excitement. The BFF, Emma and I load ourselves into the Prius for our drive south. We make stops at Target and Trader Joe’s in Silverdale, and I notice the BFF looking weary as she pushes carts in the stores. She has said since before I arrived that tomorrow she hopes to make a trip to Port Townsend. Every time I visit, she talks about going to Port Townsend, just for a brief getaway, to visit a bookstore dedicated to writers. We have yet to make it to Port Townsend. My BFF has the biggest heart in the world, but her energy levels are not what she’d like them to be. I doubt that we’ll get out of the house tomorrow, much less to Port Townsend. But that’s OK. That’s why I’m here. To help with household things, to feed and walk Sam, to pick up Maggie from school, to be the other grownup in the house when the BFF’s husband is in California, working. 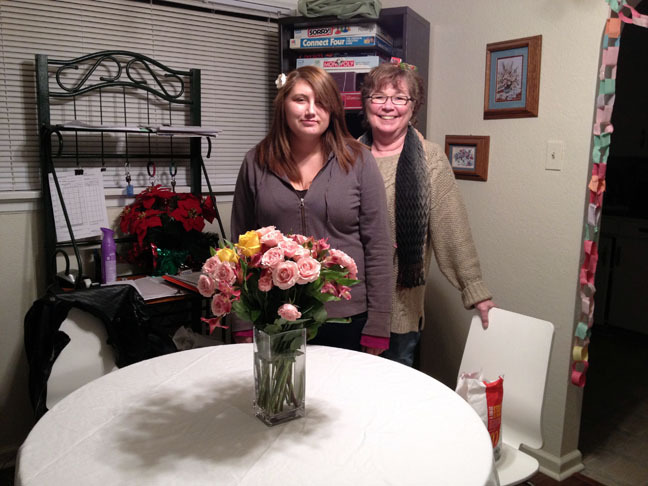 At Emma’s house, we walk in with soup for the fridge and fresh flowers and a new Ikea vase for the table. 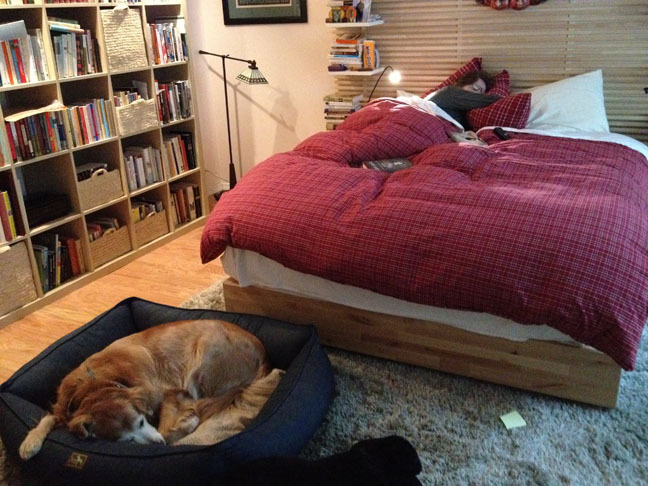 There are two roommates and two staff people there, the young women in Emma’s life. To my surprise, the BFF takes to Emma’s room like a tornado, making her bed with new violet sheets, shaking out two duvets and an electric blanket. I hand Emma her half-consumed Orange Crush and a half sandwich from lunch for the mini fridge in her room. We retrieve bed pillows from the floor and replace them on the freshly made bed. 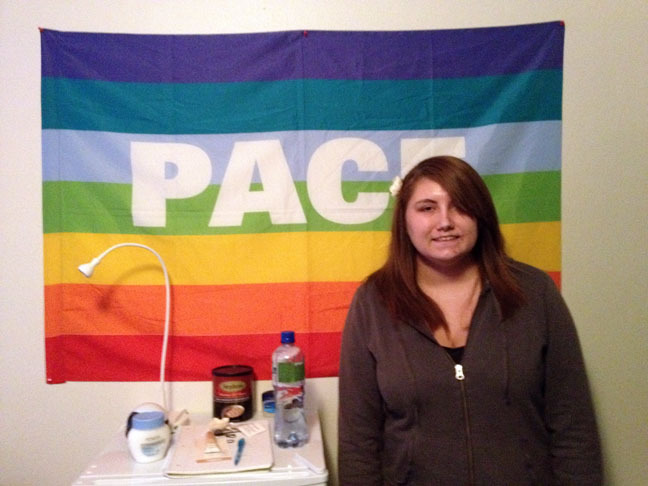 Emma poses for a photo under the rainbow-striped flag she got on a family trip to Italy that says, “Pace.” Pah-chay. Peace. Oh, yes. There is the sound of my BFF’s wooden needles clicking in the chair next to the sofa where I sit. There is big Sammy dog on his soft bed in front of the TV. There is the knowledge that one daughter is safe in her Tacoma home and the other is in the living room watching a different TV. There is a son in Utah in college. There are grown children in California with their families. Though I know I will not see Port Townsend tomorrow, though I know tomorrow will be a day of rest for my BFF, I am not disappointed. I am happily here, safe and warm, too. I will take Sam for a walk on the beach. These are the ups and downs of love. We talk, we knit, we cook, we rest. We do it again. And we are oh, so, grateful, my BFF and I, for this time together. We would not trade it. Ever. Amene, as the Hawaiians say. Ahhhh-men-ay. Hi Jan, This is heartwarming. I can feel the love between you and your friend. Wishing you and BFF the very best.